Manchester, Manchester University Press, Human Remains and Violence , , 256 p.
Destruction and human remains investigates a crucial question frequently neglected in academic debate in the fields of mass violence and genocide studies: what is done to the bodies of the victims after they are killed? In the context of mass violence, death does not constitute the end of the executors’ work. Their victims’ remains are often treated and manipulated in very specific ways, amounting in some cases to true social engineering, often with remarkable ingenuity. To address these seldom-documented phenomena, this volume includes chapters based on extensive primary and archival research to explore why, how and by whom these acts have been committed through recent history. Interdisciplinary in scope, Destruction and human remains will appeal to readers interested in the history and implications of genocide and mass violence, including researchers in anthropology, sociology, history, politics and modern warfare. Élisabeth Anstett is a Researcher in Social Anthropology at the Centre National de la Recherche Scientifique, France, and a Director of the Corpses of Mass Violence and Genocide programme funded by the European Research Council. 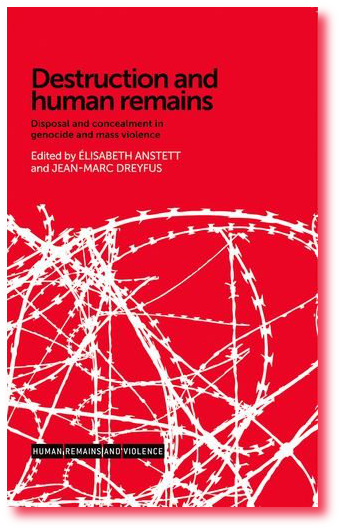 Jean-Marc Dreyfus is Reader in Holocaust Studies at the University of Manchester and a Director of the Corpses of Mass Violence and Genocide programme funded by the European Research Council.